Rarely do I pick up a non-fiction book and cannot put it down. 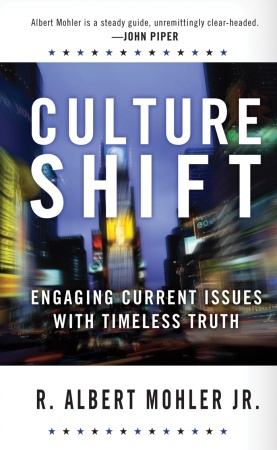 Yet, when I picked up Al Mohler’s new book, Culture Shift, I could not put it down until I was done reading it. Granted, the book is really a brief introduction to Christianity’s influence on practical cultural issues (only 160 pages) but it was not the low amount of pages that made it a must-read, it was rather the content that was life changing for me. Mohler, one of the greatest minds in the Evangelical church today, is President of The Southern Baptist Theological Seminary, Louisville, KY. And while this may be his first book, it is hardly his first foray into writing. Amongst a plethora of articles and chapters for books, Mohler has an almost daily blog that deals with many cultural issues and how Christians are to respond. In fact, many of these chapters in his book, Culture Shift, were originally written for his blog. But, even if you have read these before, you must read them again. We as Christians, Mohler notes, often take two approaches to our involvement with culture. Some take the extreme of non-involvment. For instance, hard lined Classical Dispensationalists may argue that we as Christians have no real responsibility to transform culture at all apart from the proclamation of the Gospel. Whereas, on the other side liberal theology becomes so involved with transforming culture that they neglect the actual mission of the church; evangelism. So, the first thing that Mohler does in his book is articulate issues of culture, engagement, and the Christian’s responsibility to culture. The first five chapters then seek to introduce these issues, and defend a Christian’s engagement and involvement in culture and to denounce the concept of a purely secular culture. Mohler then begins to engage various issues with logical clarity, an unparalleled knowledge of society’s best writers, and an unfailing adherence to the Scriptures. Mohler discusses areas of offence, the role of the Supreme Court on religion, terrorism, public schools, the God gene, parenting, dishonesty, abortion, natural disasters and God’s sovereighty, nuclear war, and racism. In each chapter Mohler surveys the writings of some of America’s greatest writers, praising them where they are correct, criticizing them where they are wrong. He clearly interacts with the issues and then responds with Scripture where it applies. While these are not in-depth critiques of cultural issues, they are tantalizing surveys of the issues. I found myself many times thinking I needed to read the book Mohler was talking about in a particular chapter. You may not agree with Mohler on every issue. For instance, on the use of torture especially in terrorism cases I am not sure I agree with a blanket ban on the use of torture as in the McCain amendment. But I am willing to be persuaded by further study. On the other hand, I think Mohler is right on with the issues of our coddling of our children, the maintaining of both God’s sovereignty and His benevolence when we talk about national disasters, and the renewed effort we need to make in the pro-life movement. Overall, I found Mohler’s book challenging and enlightening. It really challenged my thinking as to my involvement in culture and my role as a member of the body of Christ in transforming culture for Christ. Every Christian should read Mohler’s book. They should devour it in one sitting and then sit down and chew over every issue. This book will challenge you and spur you on to further study of the issues. Overall, it will challenge you to truly live as a light for Christ in a dark world. Mohler has hit a home run with this book and I hope he continues writing more on this subject as it is desperately needed in the church today. Cannot be more highly recommended. The following is the brief biography I wrote for the up-coming 3 volume Encyclopedia of Christian Civilization from Blackwell Publishers this year. Since I’m working more specifically on Gill I thought I should briefly introduce him! John Gill was born in Kettering, Northamptonshire on November 23, 1697 to Edward and Elizabeth Gill. His parents were God-fearing individuals of the Calvinistic Baptist tradition. His father served as a deacon in the Baptist work in Kettering. Gill grew up in a good Christian home. His early years were spent studying in the local grammar school where he excelled in languages. Unfortunately, he was no longer able to attend by the age of 11 since it was required that students attend morning prayer at the parish church. His parents being dissenters would not allow this. This was the end of Gill’s formal education but he spent his time wisely teaching himself and not only excelled in Greek and Latin but was quite adept at Hebrew by the age of nineteen. He was converted to Christ at the age of twelve but was not baptized until he was nineteen on November 1, 1716. He was married to Elizabeth Negus (d. 1764) in 1718 and they had three children that lived beyond infancy: Elizabeth, John, and Mary. The church at Kettering recognized his gifts as a preacher and in 1719 became pastor of the famous Horselydown congregation in London. Benjamin Keach had previously served as pastor in this church and eventually C. H. Spurgeon would become pastor of this church. Gill would become a prolific author and influential theologian of the Particular Baptist cause. His writings include The Doctrine of the Trinity Stated and Vindicated (1731), The Cause of God and Truth (1735–1738) which was a return to Daniel Whitby’s Discourse on the Five Points which was a refutation of Calvinism. His magnum opus was his three volume An Exposition of the New Testament (1746–1748) and his six volume Exposition of the Old Testament (1748–1763). He also wrote A Dissertation on the Antiquity of the Hebrew Language (1767), A Body of Doctrinal Divinity (1767) and A Body of Practical Divinity (1770). He received an honourary Doctor of Divinity degree from the University of Aberdeen in 1748. He would become one of the most influential Baptist theologians ever. The major controversy that has erupted over the influence of Gill has been over the issue of Hyper-Calvinism (the belief that unsaved man is not obligated to respond in faith in Christ and therefore preachers should not offer the Gospel to those who are the non-elect). Some have attributed to Gill to be the first systematizer of a Baptist Hyper-Calvinist theology. Others have argued that Gill was in fact not a Hyper-Calvinist. Regardless, it was during Gill’s time period when the Particular Baptist Churches began their decline into Hyper-Calvinism. Gill did believe in eternal justification (that the elect were justified in eternity past) and did not seem to appeal to all in the same way that further generations of Evangelical Calvinists did, but it seems difficult to say that Gill was undeniably in fact a Hyper-Calvinist. Instead, most likely, Hyper-Calvinists used Gill’s theology and went past him to solidify their own theology. Gill is the first major writing Baptist theologian and his works retain its influence even to this day. Just yesterday I posted about my concerns over the state of the future of Baptist Historical scholarship. Well, I have taken to study John Gill of late. Gill (1697-1771) has become my new best friend. I will be submitting my research proposal in the near future to Leiden University with the title “John Gill (1697-1771), Defender of the Trinity in the English Enlightenment.” I know this takes me in a different direction than my previously planned Andrew Fuller studies, but things do change. A new school, a new supervisor, and therefore in some ways, a new dissertation topic. It still fits my criteria: 18th century Particular Baptists; an important Baptist; a big theological issue. You cannot get much bigger than Gill and the Trinity debates in the 18th century. “This brief survey of Gill’s sources indicates that, after the Bible, the main positive points of reference for Gill’s theology were the great Reformed and Puritan writers of the seventeenth century. The point is important for several reasons. In the first place, it locates Gill in relation to the Reformed dogmatic tradition, specifically, the tradition of Puritanism and its continental analogue, post-Reformation Reformed orthodoxy. Second, without in any way diminishing Gill’s commitment to the distinctive teachings of the Baptist churches, it identifies the larger number of his theological antecedents as thinkers not belonging to the Baptist tradition: Gill was not, in other words, an insular thinker, but he was clearly selective. Third, the point establishes Gill as a highly independent thinker in a relative sense: he was able to exert a degree of independence over against even his most trusted sources in order to position himself within the Particular Baptist tradition and in the context of the problems and debates confronting theology in the mid-eighteenth century. 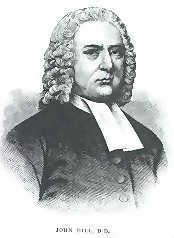 Fourth, Gill ws able, given the kind of sources with which he was acquainted, to produce a theology that was at once fundamentally Baptist and largely Reformed, and that because of its stance on a solid traditionary ground, was also able to maintain its distance from and dissonance with many of the currents of eighteenth-century theology” (Richard A. Muller, “John Gill and the Reformed Tradition: A Study in the Reception of Protestant Orthodoxy in the Eighteenth Century,” in Michael A. G. Haykin, ed., The Life and Thought of John Gill (1697-1771): A Tercentennial Appreciation [Leiden, The Netherlands: E. J. Brill, 1997], pp. 55-56). My point? Particular Baptists are worthy to be studied in and of themselves. They are (like Gill for example) part of the stream of Reformed and Post-Reformation orthodox thought. In fact, someone like Gill, made many contributions to theology that need to be studied out. You do not have to feel like you need to study someone out of the Baptist stream of history to prove yourself to scholarship. Here is Muller showing us that someone like Gill can stand alone and be studied on his own merit because Particular Baptists, just like Presbyterians and Independents made valuable contributions to theology, polity, spirituality, and many other areas and therefore are worthy to be studied alongside our other Reformed friends! I am concerned for the future of Baptist historical scholarship sometimes. I have spoke with Baptist friends with a great love of the Baptist faith (most specifically the Particular Baptist stream) who feel that they need to do work in the area of other individuals outside the Baptist stream to prove themselves in scholarship to those outside of the Baptist stream. If we do work in Puritans, Presbyterians, Independents, etc., then we can prove ourselves to the scholarly world. They know that those kinds of dissertations and such will also prove themselves to Baptist scholarship, so they say it is okay. I am not thinking of anyone in particular here as I have heard this kind of thinking from a number of individuals. In my opinion then the Baptist cause suffers. I spoke with someone from a Baptist publishing company just last week about the possibility of reprinting some early Baptist works, but there is just not the money nor seemingly, the interest out there. But no offense to my good friends at the Banner, but they do not seem to have to worry about reprinting all of their good Presbyterian friends! What about the Baptists? Why do they have to take second chair to everyone else? Where are all the Baptist scholars out there? Where are the Michael Haykin’s? Where are the Tom Nettles? I know I am no Baptist history expert. But I do have a love for Baptist history and want to see the stream of our Baptist forefathers explored further and taught and loved and written about. I want to see more people writing about Baptist history and our Baptist forefathers. My call to you is, if you are considering historical research and study and are a Baptist, do not just decide to study Edwards or Owen or anyone else like that. Study Gill, Keach, Fuller, Spurgeon, etc. We have a great history in our Baptist circles. Let’s see the future of Baptist historical scholarship grow and develop! Let’s see old books republished and new books written! Let’s study these men and women’s lives. Let’s love where we have come from! You are currently browsing the Working out Salvation with Fear and Trembling blog archives for January, 2008.